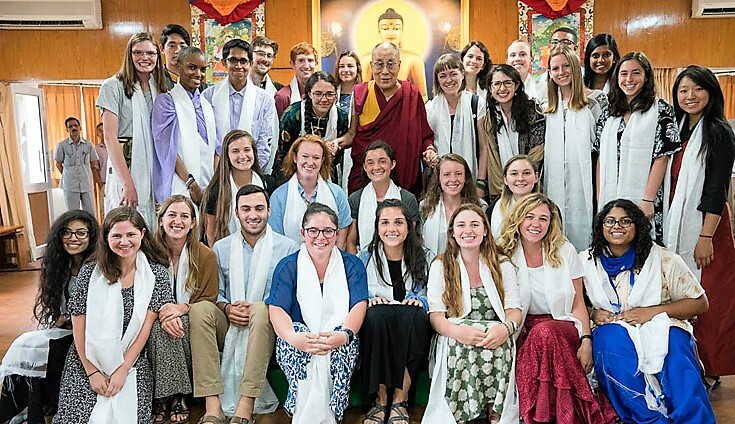 Thekchen Chöling, Dharamsala, HP, India – His Holiness the Dalai Lama met with a group of students taking part in the Emory Tibetan Mind/Body Sciences Summer Abroad Program at his residence today. He greeted them warmly. “On a physical level, India has been my second home for the last 58 years,” he told them. “But on a mental level, since the age of 6 when I began to study, I have been immersed in ancient Indian knowledge. We are stateless refugees, but India is the source and home of what we know. And the freedom India has afforded us the opportunity to meet and get to know many different people, spiritual leaders and scientists among them. “Buddhism, especially the Nalanda tradition, has taught us to apply reason, to experiment, to analyse and use our intelligence. The practice we follow aims to free all sentient beings from suffering and bring them happiness. However, there’s little we can do directly for beings elsewhere in the universe, and little we can do to help the insects, animals and birds of this world. Those we can help are our fellow human beings with whom we can communicate. Human beings have such intelligence, what a pity that so often it is used to make trouble. His Holiness noted the special connection that has grown between Emory University and Tibetans. One result is that there are now 1000 monks in the great monasteries re-established in South India who are proficient in science and English. His Holiness remarked that Tibetans have kept alive a command of logic and an understanding of the workings of the mind and emotions for more than 1000 years. This knowledge remains relevant and helpful for living a happy life here and now. He added that although its source was in India, modern Indians have by and large neglected it in favour of modern development. Consequently, he said feels it is important to work to revive this ancient knowledge in India today. Professor Lobsang Tenzin Negi introduced the group—25 students from Emory University and two from colleges nearby and four faculty members. He mentioned that this particular Summer Abroad Program started in 2009. It is a six-week immersion experience that offers students the opportunity to interact with leading members of the Tibetan exile community—including Emory Distinguished Presidential Professor His Holiness the Dalai Lama—while participating in the growing dialogue between modern science and the Tibetan Buddhist contemplative tradition. While in Dharamsala, students study meditation, Buddhist philosophy, Tibetan medicine, and the culture of Buddhist Tibet at the Norbulingka Institute, the Library of Tibetan Works and Archives, Men-Tsee Khang, the Tibetan Medical Institute and Gyuto Tantric Monastery. At Drepung Loselling Monastery in South India, which has been involved since 2014, students can engage with the monastic community and, in conjunction with the Emory-Tibet Science Initiative, interact with Tibetan monastics studying neuroscience, biology, and physics. Before taking questions from the students His Holiness said he wanted to make it clear that although it is recorded in Buddhist texts, he regards the understanding of the workings of the mind and emotions that he has been talking about as belonging to ancient Indian knowledge more generally. He noted that at Nalanda University extensive exchange of views took place in debate and participants learned from each other. He observed that all Indian traditions that pursue the practices of shamatha and vipashyana, concentration and insight, have a deep and broad acquaintance with the workings of the mind. The student who asked the first question wanted to know how meet the various challenges and obstacles to establishing an era of peace. In his reply, His Holiness spoke of his admiration for the spirit of the European Union, despite the narrow British vote to leave, according to which past enemies have come together to work for their mutual benefit. He said the current reality is that nations are no longer isolated and self-sufficient as they once were. The world has become much more interdependent, therefore there is a need to be more aware of the oneness of humanity. Another student wanted to know if, of the many decisions His Holiness has had to take, he looks back on any of them with regret or doubt. His Holiness replied that it was difficult to say, but mentioned that when he is in a dilemma he makes a point of discovering what other people think before making his own decision. Asked how to pursue success in a capitalist society to benefit of others, His Holiness responded that there is nothing wrong with creating wealth or a dynamic market economy. The important point is to share the wealth you make or put it to beneficial use. He recalled a wealthy Bombay family asking for his blessing. He told them that if they were to spend their money on providing educational facilities for the children of the Bombay slums that would be a much more effective source of blessings. To a question about how to learn from suffering, His Holiness suggested that cultivating a more compassionate attitude has the effect of opening the mind. Having a calm and compassionate mind, he said, enables us to use our natural intelligence more effectively. Without a more holistic perspective it’s difficult to appreciate the reality of a given situation and without that any action we take is likely to be unrealistic and so unsuccessful. The final question related to making to the question of non-violence. He reported that after coming into exile following the Chinese occupation, Pandit Nehru warned him that the USA would not go to war with China to defend Tibet. Appeals to the UN were in vain. In 1974, Tibetans decided that they would not seek outright independence, which led to the eventual formulation of the mutually beneficial Middle Way Approach. Fundamental to this is the principle of non-violence, which has attracted widespread moral support even among informed Chinese.